The Hotel Milano Castello is in a great position to reach in 2 minutes on foot Piazza Castello, the departure and arrival point of the ATMosfera restaurant tram. 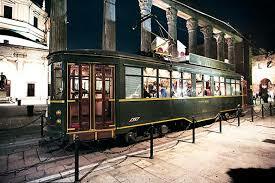 ATMosfera trams are the result of careful design work, restyling and modernization of the oldest trams in Milan. The interior space has been optimized to obtain the maximum comfort possible, while maintaining the original structure of the car. Remodeling the original teak benches, tables were obtained with comfortable seating in a fixed position for a total of 24 seats, divided into 4 tables of 4 people on the left and 4 tables of 2 on the right. On board there is also a kitchen, a wardrobe and a toilet. The proposed menus, based on meat, fish and vegetarian, updated periodically to ensure the freshness and seasonality of the products, are the work of established chefs always on board. The wine list offers the possibility to choose between selected labels, which favor quality and pairing with the proposed food. 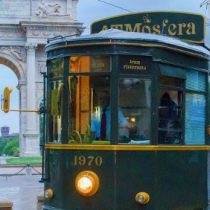 The ATMosfera restaurant trams welcome you every evening, by reservation, in Piazza Castello number 2 (corner via Luca Beltrami) and, during dinner, accompany you to visit suggestive places of historical and contemporary Milan. In addition to the Duomo and the center of Milan, it is possible to admire the Arco della Pace, the new Porta Nuova area and Gae Aulenti square, where the Skyline stands with the "vertical forest", which contrasts the historic buildings of Milan like the Scala Theater, the Vittorio Emanuele II Gallery, the Duomo and the dock, also famous for its "movida". The Sforzesco Castle will be the setting for the departure and arrival of the ATMosfera trams, in a historic setting among the most evocative of our territory. The proposed itineraries vary periodically both on the basis of road signs and to offer different views of Milan each time.